This Banana Pancake is a great quick breakfast option that’s ready in 30 minutes. It’s thick, soft and super fluffy. You’ll be looking forward to breakfast. I have quite a few variations of pancake in my website. From classic Vanilla Pancake, to Dutch Baby Pancake, Blueberry Pancake and some more. They all come in a small batch for 2-3 people, I would say reasonable enough for most people. But for someone like me who live alone, I guess 6-8 pieces of pancake is quite a lot don’t you think? I mean pancakes are good for freezing, but since they are so easy to make, I prefer making them the same day I’m eating it. They taste better when freshly made and eaten the same day, better yet right off the pan. I remembered making a tall stack of Strawberry Pancake, and my brother asked me if I ate all of it. Sad to say, No. At least not at one meal, it took me weeks to finish all of them. While having a huge batch of pancake recipe is nice to have, I’ve decided it’s time to make a single serving portion just enough for one breakfast meal, a pancake just for me. This Banana Pancake was my first single serve pancake in my blog, and after making it I promised myself this won’t be the last. This is just the beginning of many single serving pancakes so watch out for that. This one I can proudly say I finished in one seating, it was such a lovely to have a clean plate and not feel stuffed from over eating. As I always say, “food it meant to be enjoyed”. This Banana Pancake is so ultimately soft and fluffy without exaggeration. It has a sponge like texture, it has nice subtle banana flavor and right level of sweetness (at least for my taste). I was so excited admiring it while I was taking photograph of it, and when I sliced it, I just can’t wait to eat it. I can feel the softness of the pancake as the knife cut through it, and I can see from looking at it bottom up and sideways how thick they are. This is a kind of breakfast that will take your breathe away, it was just so beautiful. My perfect single serving banana pancake, give it a try and see for yourself. Let’s get started! Wet Ingredients: Mash the banana using a fork, then add milk and beaten egg together. Cook: Heat your frying pan or griddle to medium heat and brush the pan with butter or grease it with oil using a paper towel. Divide the pancake batter into 4 and pour each portion into pan or griddle. If you do not have a large pan, cook the pancake one at a time. Do not over crowd as you will have difficulty flipping it. Leave the pancake for 4-5 minutes without touching it or until bubbles on the top start to pop and the sides are browned and stable. Gently flip to cook the other side of the pancake. Cook the other side about 2-3 minutes. Wipe your pan off after every two batches or so, and grease with butter and oil as needed. Serve: Serve warm top with sliced Banana and drizzle with honey on top. 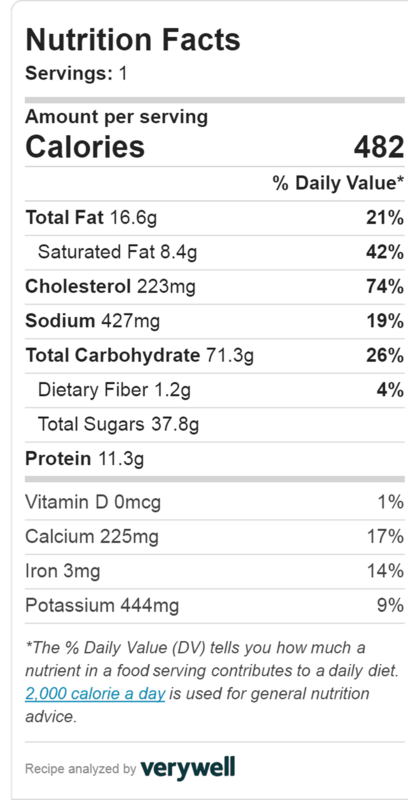 Nutritional Information was calculated using Veryfitwell Recipe Calorie and Nutrition Calculator. For details about Nutrition Information in this website, please read the Disclaimer page. I love pancakes! Your recipe looks fantastic!! Funny. I had banana-pecan pancakes for breakfast this morning!